400 W. Huron, located in the heart of Chicago’s River North neighborhood is being developed by Smithfield Partners, the same developers as SoNo and 30 W. Oak. 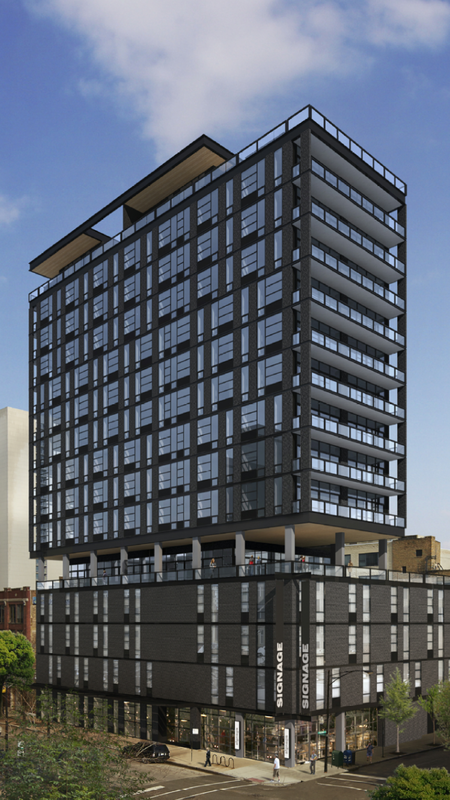 400 W. Huron is slated to rise 16 stories into the air. Luxury residential units will start on the 5th floor and rise up to the 15th floor. The 16th is comprised of private roof deck for 15th floor units. The condominiums at 400 Huron start at 2,144sf and go up to 4,931sf for the largest unit. The smallest unit is a Three Bedroom, Two and Half bath home, while the largest is a Four Bedroom plus Den, Library and Family with Four Full baths and Two half baths. The amenities at this new luxury building in River North include everything from a state of the art fitness center to a heated garage and 24hr door staff. The finishes of the actual units will be top notch. They’ll include Valcucine Kitchens and Baths, Miele appliances, custom closet built ins, 10ft ceilings throughout, Floor to Ceiling Windows, Toto plumbing fixtures and upgraded Grohe faucets. Pricing is set to range from roughly $1,250,000 (3 Bedroom condos) up to $4,000,000 (4 Bedroom + Condos). New construction developments have been rare in recent years. While 400 West Huron is not a large development at only 26 units, it does help satisfy a much needed demand for new construction in River North. Floor Plans have not been released on other websites as of yet, but I have had a chance to review them. The architect has done an incredible job at maximizing the square footage and use of space per unit. All kitchens open up to large great rooms and bedrooms are situated properly away from the main living areas. Outdoor space is a key feature in this building with many units having balconies (terraces might be a better word to use) that run the length of the unit. Penthouse units even have access to private roof space.